First of all, you can purchase your Oyster card at the ticket window of any tube station or order it online at the Transport for London website. Keep it in the little plastic carrier they might provide you (souvenir shops sometimes sell cute versions of them, too) or stick it in an exterior pocket of your wallet. However you carry it, make sure to have that sucker in your hand and ready in advance of approaching the gates—nothing is more annoying than nearly running into someone who abruptly stops right in front of the gate to fish out their card or ticket; this is usually the sign of a tourist or a particularly dense and/or inconsiderate person. I’m serious. Don’t be the one who interrupts the flow of commuting traffic. Please. You’ll have to put money on your Oyster card initially on purchase, so when you first use it at a tube station, approach the gates to the trains and look for the glaringly obvious round, yellow pads with an Oyster symbol. 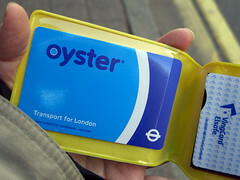 Simply lay your Oyster card against this yellow pad—don’t tap it quickly, as it might not register that way, but hold it there only long enough to hear the gate beep and open the doors for you. It usually only takes a second or two. If you have luggage, look for the special double-wide gates for just such purpose (usually to the far left or right of the regular ones). You’ll also want to pay attention to the little illuminated sign sticking up at the right-hand side of the gate. First of all, it will either have a green arrow (pointed left toward the gate doors) or a red X lit up on it. The green arrow is your signal that you can pass through the gate on that side. The red X means that only those approaching the gate from the opposite direction can go through it. It’s a simple means of traffic control, so pay attention so you don’t frustrate people by trying to enter through the wrong gate. Also on these signs, some (not all) of the time you’ll see a white number at the bottom (denominated in pounds) after you’ve tapped your Oyster card and as the gate opens for you; this figure is the remaining balance on your Oyster. Now as far as that Oyster account balance goes, if the gate indeed shows iton its black sign to the right of the doors, the figure displayed on entering a tube station is going to be what you’re first coming in with—it will not reflect the fare deducted for that trip, simply because it doesn’t yet know where you’re going! The city is divided into multiple zones that form concentric circles around the greater London area as a means of gauging distance of travel. For example, it will cost you less to travel within a zone than between zones because the former distance is shorter than the latter. So, your travel fare won’t be deducted until you tap your Oyster card for the second time upon exiting the gates of your destination station. Stay tuned for the next installment of my “Idiot’s Guide to the Oyster Card” on Monday (after our usual Weekend Warrior series!) in which I explain how to update the balance of your Oyster card, as well as where else you can apply it.